Ray’s amazing journey began decades ago when at 16-years of age, he was caught spraying graffiti on a wall at Yankee Stadium by NY Yankees owner, George Steinbrenner. As fate would have it, Steinbrenner decided against putting Ray in jail and instead, offered him a second chance making him the batboy for the greatest franchise in sports history. Ray was propelled into a dream job sharing the dugout with the “Bronx Zoo” team of the seventies. He became a positive influence in the fiery clubhouse that included Manager Billy Martin, superstar Reggie Jackson and the legendary Thurman Munson. And for the next 35 years, Steinbrenner and Ray built a special relationship until Steinbrenner’s passing in 2010. Steinbrenner’s vision lives on through Ray. 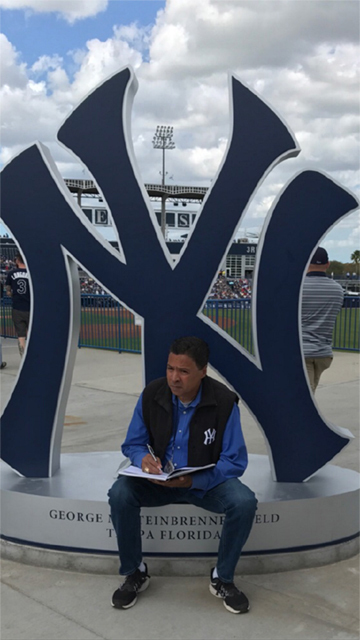 As a Community Consultant for the NY Yankees, Ray is immersed in ensuring that veteran players and Yankee rookies promote the tradition of the club’s pride and inspiration by visiting terminally sick kids in hospitals and supporting the inner-city youth throughout New York. He is the founder of “Hank’s Yanks”, a not for profit competitive youth travel baseball team of underprivileged kids (ages 10-18) sponsored by New York Yankees co-owner Hank Steinbrenner. Ray is an avid writer, publishing four children’s books. His first book, “The Boy of Steel” was #2 on the NY Times Bestseller List and is currently displayed at the National Baseball Hall of Fame in Cooperstown. His third book,”One Last Time: Goodbye to Yankee Stadium”, reached #1 on Amazon’s Bestseller List. In 2012, he published his memoirs “Yankee Miracles: Life with the Boss” and co-wrote a children’s holiday book with Yankees pitcher CC Sabathia. As a film producer, Ray developed the full-length animated feature film “Henry and Me”, about a boy’s magical journey as he battles cancer, based on his children’s books. Voices for the animation include Richard Gere, Cyndi Lauper, Chazz Palminteri, Danny Aiello, Luis Guzman and Paul Simon. Ray is also the Associate Producer and co-stars in the film “Stano” starring Sofia Vergara and Joe Manganiello. Ray is a member of the International Latino Hall of Fame and the Ted Williams Hall of Fame for his humanitarian efforts with children around the country. In 2007, the Department of Homeland Security honored Ray for his leadership in the Hispanic community and the impact he has made on American society. Additionally, Ray can be heard on weekends on IMPACT on ESPN Radio 1050am talking baseball and entertainment. His writes a weekly column for NY Sports Day, Newsmax and Baseball America.Â A powerful and inspirational speaker, he passionately shares his amazing journey, revealing his experience with the Bronx Bombers, special relationship with Steinbrenner and what it was like to hang around some of baseball’s greats.